Another state-owned lender Union Bank of India had last week reduced its one-year MCLR by 65 basis points, or 0.65 per cent to 8.65 per cent. Sources say the government is nudging state-owned banks to cut lending rates as they have garnered huge deposits in the wake of demonetisation. On Friday, IDBI Bank and State Bank of Travancore had announced a cut in lending rates. IDBI Bank will charge 9.15 per cent on one-year loans against 9.30 per cent now, its three-year MCLR rates have been revised to 9.3 per cent per annum down 0.40 per cent; while six-month loans have been pegged at 8.9 per cent down 0.35 per cent. MCLR is the benchmark rate to which all loans are linked. 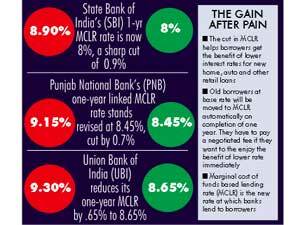 A cut in MCLR helps all new borrowers get the benefit of lower interest rates for all kinds of loans. By the MCLR method, banks will have to price loans on the marginal cost of deposits rather than the average cost of deposits. In the rate-cutting cycle that began on January 2015, the RBI has brought down the repo rate cumulatively by 175 basis points, however the base lending rates of banks had come down only by about 75 basis points till a few months ago. However post-demonetisation in November, banks have been flushed with deposits. Some news reports say banks have garnered Rs 14.9 lakh crore deposits after demonetisation. With its new MCLR cuts, SBI has reduced its benchmark rate by 200 basis points from January 1. For SBI, its one-year MCLR rates are now 8 per cent per annum against 8.90 per cent, while for two-year loans are at 8.10 per cent and three-year maturities at 8.15 per cent, SBI said in a statement. In a stock exchange filing on Sunday, PNB said its one-year linked MCLR rates stand revised to 8.45 per cent against 9.15 per cent earlier. Similarly, three-year MCLR stands reduced to 8.60 per cent compared to 9.30 per cent, five year rate has been revised to 8.75 per cent. “Since November 1, 2016, the reduction in MCLR is 85 basis points,” PNB said. While an MCLR cut would benefit new borrowers, old borrowers have two options to get the benefit of lower rates. For home loans up to Rs 75 lakh, SBI home loan rate for women borrowers is 20 basis points above one-year MCLR and 25 basis points for others. For loans above Rs 75 lakh it is 35 basis points above one-year MCLR rate for women borrowers and 40 basis points above one-year MCLR for other customers. Assuming SBI continues with the same risk premium/spread, its home loan rate for loans up to Rs 75 lakh would be 8.20 for women and 8.25 per cent for others. The prime minister had, in his address, said: “While respecting the autonomy of banks, I appeal to them to move beyond their traditional priorities and keep the poor, lower middle class and middle class at the focus of their activities." In a bid to ensure that banks fully pass on the benefit of rate cuts from the central bank to borrowers in the form of lower lending rates, the Reserve Bank of India (RBI) in April 1, 2016 introduced the MCLR loan pricing system. Vibha Batra, an independent analyst explained, “MCLR will see a greater reduction this year as last year’s (lower) deposit rates will start getting reflected this year. Also, credit demand remains low. Remonetisation will take at least four-five months. With credit demand being soft, I expect a significant reduction in both lending and deposit rates." With demonetisation and government pushing for cashless transactions, the currency in circulation will fall. Bank credit growth is expected to be in the range of 6.5-7 per cent in 2016-17, according to many economists. The credit growth for the current quarter has been under pressure. The growth in advances for the fortnight ended December 9 was only 5.4 per cent year-on-year and on a year-to-date basis the loan book of the industry has declined by 2.5 per cent or around Rs 1.91 lakh crore in absolute terms. With corporate shying away from incremental borrowings due to the economic slowdown and retail credit also taking a back seat, overall credit growth for FY17 is likely to remain under pressure and may be at par with GDP growth, said Siddharth Purohit, senior research analyst at Angel Broking. Another variable is the differential in MCLR and one year commercial paper rate which stands at 2.5 per cent and has to converge and so that both lending and deposit rates can fall. “But if a bank has a large amount of Non-performing assets (NPA), it will have to balance between cutting lending rates and asset quality pressures,” added Batra.